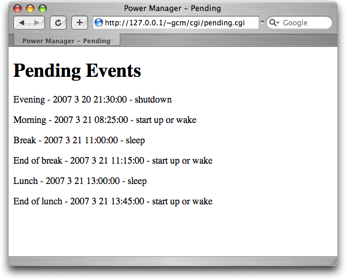 For those that can not wait, below is a Perl CGI snippet that displays your pending events in a web page. Not pretty but functional; adding CSS and formatting is easy and left as an exercise. For those new to running Perl CGI scripts on a Mac, the following online book is a great starting point, CGI Programming With Apache and Perl on Mac OS X. The script above uses the command line interface to Power Manager and the flag -f Perl. The -f flag formats the output in ready-to-evaluate Perl code. I recommend exploring the possibilities of powermanagerctl. You have complete control over Power Manager and can combined it with your favourite UNIX tools. Having command line access to your schedule is great fun. It opens up endless possibilities. In this case a fairly plain web page, but in the real world being able to script event information directly is a great time saver.